After the recent rash of automotive recalls, Americans are looking more than ever for quality and reliability in their cars. J.D. Power's latest rankings of long-term reliability, released Thursday, show domestic brands, such as Ford Motor (F) and General Motors' Buick and Cadillac nameplates continuing to make headway on that front by decreasing the number of problems with their vehicles. Porsche topped J.D. Power and Associates' 2010 Vehicle Dependability Survey with a rating of 110 for its 2007 models, making the Germany luxury car maker's vehicles almost 30% less problem-prone than the survey's overall average of 155. The J.D. Powers surveyrates 3-year-old cars based on how many problems they averaged per 100 vehicles in the previous year: Thus, a rating of 100 would mean that, on average, each car had one problem. Porsche was followed by Lincoln, 114; Buick and Lexus, 115; Mercury, 121; Toyota, 128; Honda, 132; Ford, 141; Mercedes-Benz, 142; and Acura, 143, Hyundai, 148, and Cadillac and Infiniti, 150. Those at the bottom of the rankings included Volkswagen (225) and Suzuki (253), with Land Rover (255) bringing up the rear. J.D. Power said 25 of 36 vehicle brands showed improved long-term dependability in 2010, compared with last year's performance, continuing a steady trend of industry-wide improvement. Such improvement is good news for both owners and auto makers, said David Sargent, J.D. Power's vice president of global vehicle research. "Manufacturers benefit from lower warranty expenses, while consumers incur lower maintenance and repair costs, as well as less inconvenience." Despite its recent spate of recalls, Toyota Motor (TM) performed quite well in the survey, with its Prius and Corolla models taking the No. 1 and No. 2 spots in the compact car segment, and its Sequoia and Tundra models earning top honors in the large multi-activity vehicle and large pickup categories, respectively. Highlander and 4Runner models placed first and second, respectively, in the midsized multi-activity vehicle segment. Toyota's Lexus luxury brand placed first and second in several categories. Honda Motor (HMC), with three category leaders, had the second highest number of top-ranking vehicles. 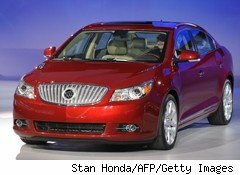 Ford's luxury brand Lincoln topped two segments, while Buick's LaCrosse placed highest within the fiercely competitive midsized car category.